Through personal documentation that I have collected over the years of different bodies of water, rain, ice, glaciers and clouds at various times of day and seasons, and from various locations, these materials will act as sources for the creation of the subsequent work. Using documentation of water in various states and forms from Alaska, British Columbia, Japan, Newfoundland and Toronto, the addition of research pertaining specifically to water while in the Azores would be a rich and unique development of my practice. I am proposing to make new paintings and works on paper that will incorporate new compositions of cuts and surface qualities that will consider the movement and character of water in various forms. 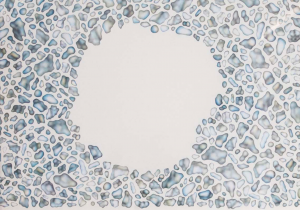 With a focus on the mutability in form of water, this series of work will consider the relationship between ephemerality and painting through the inspiration of water. This project will result in paintings and works on paper that allude to the affective, metaphysical and mysterious qualities of water. Research pertaining to the poetics and metamorphosis of water, of water’s presence and character as a mysterious entity adopted in science fiction literature and film, and of water’s relationship to psychological dimensions of dreams and the unknown, this series will attempt to capture and allude to the various characters and qualities that reside in water. As collages and photographs, the works will begin to articulate a language of a visual essay that will accompany and enhance the considerations of the series as a whole. With the significant cultural and global urgency of water and climate change, this work will consider the more poetic nature of water and it’s being, rather than its changing status as a vulnerable resource. My most recent body of work consists of an exploration of the relationship between light, ephemerality and painting, as a consideration of the way in which light can activate a surface and render the work itself as a gesture derived from the thought and consideration of the poetics of light. As natural light cascades upon the work, the work is subject to ephemeral changes in surface readings that adhere to the conditions of the atmosphere in which it is exhibited. Acting as a witness to the passage of a day, my works are abstractions of a consideration of landscape painting, one in which the landscape is reflected within the work by way of characteristics apparent in different landscapes and climates rather than as a representation of such. Rather than paintings of light or painting that incorporates the theatrics of artificial lighting, these works are gestures that wait to welcome and enhance the already existing conditions of light within the areas in which they are installed. Haley Uyeda recently completed an MFA at York University (2016) and holds a BA with honours from the University of Guelph (2011), where she majored in studio art and minored in psychology. After graduating from the University of Guelph she maintained active engagement in the Toronto arts community as the Programming Coordinator at Gendai Gallery and Gallery Assistance at G Gallery, both Toronto-based not-for-profit galleries. Currently living and working in Toronto, she maintains her involvement in the local arts community, while also pursuing opportunities to broaden her practice and engagement in the arts through residencies and exhibition opportunities outside of Ontario and Canada. Recent exhibitions include a solo exhibition at Seafoam (Toronto) and group exhibitions at Diaz Contemporary (Toronto) and Art Mür (Montreal).